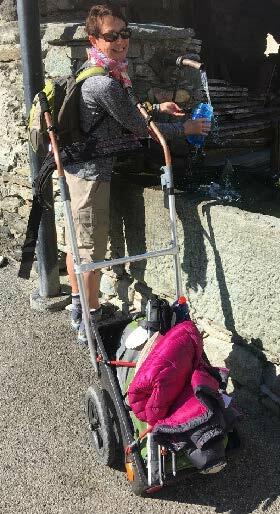 Walking with a hiking trailer takes 80% of the weight away from the body and is much easier on the knees. There’s 88% less energy expenditure when walking with a trailer. Everyone knows how it feels after a long day out on the pilgrim paths lugging one’s backpack – it will feel heavy even if one is only carrying 5 kilos. Posture is so much better – it’s easy to walk tall and effortlessly when not carrying a heavy load. People with back and shoulder problems particularly can walk easily and without pain. When carrying a backpack, even though the waist and hips take the load of the backpack they still create a forward trunk lean which rounds the upper back and causes a forward head posture with the neck extended. This creates neck and shoulder pain and make it difficult for the muscles and ligaments to hold the body up well. Using a hiking trailer helps prevent common injuries from carrying a heavy backpack – injuries such as shin splints and knee injuries. It’s possible to carry more. The 10% of body weight rule for a loaded backpack doesn’t apply! Hiking trailers are really useful for people who need to carry extra weight as a necessity – for example pilgrims who want to camp out, photographers who need to carry extra camera gear, or those who need to carry a CPAP machine on the Camino for sleep apnea. One doesn’t have a sweaty back as happens when carrying a backpack and one will feel much cooler all day as the air circulates around the whole body. The Cons start with the price of the trailers. None are cheap – they’re all expensive unless one is lucky enough to have a DIY hiking trailer as I have. The trailers range from US$385 for a Dixon Rollerpack to €836 for a Monowalker. Both of these are single wheel trailers. The single wheel trailers (though better suited to rough terrain) don’t work as well overall as the two-wheeled trailers, as the load is spread evenly between the wheel and the hip belt, so the weight towards the hips and waist is heavy. 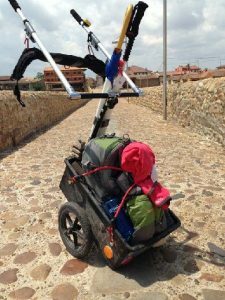 Radical Design, a Dutch company, make a hiking trailer, The Wheelie, which costs €529 for the skeleton trailer and €609 for the trailer with its own pack. This is a two-wheeled trailer. With the two-wheeled trailers the load is well away from the body and it is spread over the axle and the wheels so the axle and the wheels take all the weight. Another American trailer, the HipStar, can be taken apart and fitted into a carry-on bag. It looks fantastic. It’s in the final stages of development. The first model – a heavy duty one which would be the best one for the Camino – is going to be rolled out later this year. The price estimate is around US$350-$390 plus US$99 for shipping to Australia. Bellelli, an Italian company, make a cycling trailer with various sized carts. It’s possible to modify this trailer to make it into a hiking trailer and this is what I have – this is Spot! One really needs to do extensive research as one could make a costly mistake. The Cons continue at the airport … transport of the majority of the trailers is not nearly as easy as with a backpack, especially on the airlines as they’re a bulky item. Some trailers will need to be checked in at the Special Handling desk. Long distance trains in Europe look to be OK about hiking trailers being on board but buses can be a problem if the bus driver feels the trailer is taking up too much space in the luggage storage under the bus. This happened to me last year when I walked with Spot 1 – a prototype. 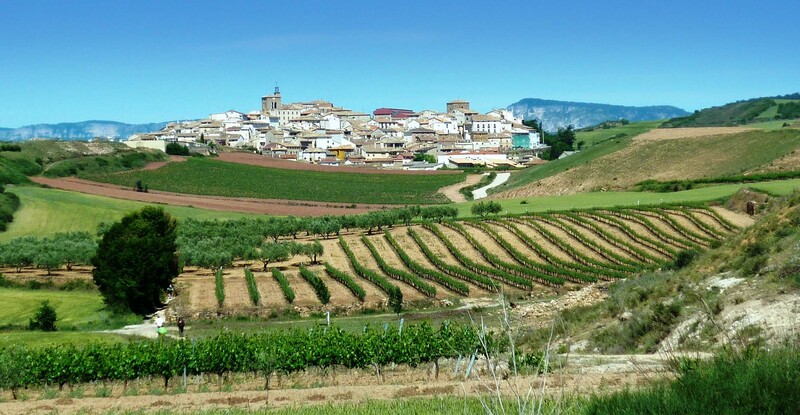 I had finished my Camino and was catching a bus from Santiago de Compostela to Santander. It was only due to the intervention of some kind Spanish people at the last minute that I was allowed to load Spot into the luggage storage and board the bus. It was a very stressful experience and one which I hope will never happen again. Hiking trailers aren’t suitable for all terrains. For example, they are not suitable for mountainside goat tracks with sheer drops on one side, the paths being narrower than the width of the trailer. It is downright dangerous to use a trailer on these sorts of tracks. Pulling a trailer over paths with large rocks is almost impossible and steep descents on rocky paths, again is dangerous. In albergues it is mostly not possible to have the hiking trailer with one in the dorm so arrangements will have to be made with the hospitaleros to store it somewhere safely. How can one deal with the Cons? There’s not much one can do about the price of a hiking trailer unless one wants to investigate the EBay or Gumtree options and then one is not sure what one is getting – not recommended. If one is handy, or knows someone who is, it is possible to modify a cycling trailer. Depending on the type of trailer one buys, transporting it IS just like getting a bike to the Camino. There is the risk of it being damaged in transit so it needs to be really well wrapped in layers of bubble wrap and tons of tape – a bit like an Egyptian Mummy! Once on the Camino and staying at albergues one needs to have a combination bike lock which is threaded through the wheels and the trailer frame so the trailer is not stolen.